The response of family and friends to Fafoutee has been very positive. Folks love the cartoon logo and the story behind the face and name. As an experiment (and maybe a bit of defiance) away from the concept of humanizing marketing on the social web and joining the “conversation”, I decided to do something a little out of the ordinary. I have been posting as the “voice” of Fafoutee on Facebook (and on Twitter). It continues to be a source of entertainment for me and the Facebook insights are positive. The 113 folks who have “liked” Fafoutee on Facebook since the page was created in June have also been engaged with an average of 4 stars of quality interactions per week. While I am not claiming any telepathic communication with my Yorkie Stanley, it is easy for me to look at him and project what I think he might be thinking. While I know that Cesar Milan would not endorse this anthropomorphic stream of consciousness, I sure am having fun doing it. 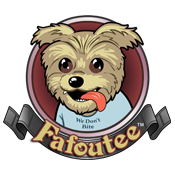 This entry was posted in Fafoutee, Small Business, Social, Social Media and tagged Anthropomorphizing, branding, Facebook, ideas, posts, Yorkies.